The Nortel IP Phone i2007 incorporates a 5.7” (12.7cm x 17.8cm) color touch-screen, bringing multimedia presentation support to the desktop IP Phone 2007. Virtual Network Computing technology optimizes content pushed from external application servers in advanced text or graphical format. 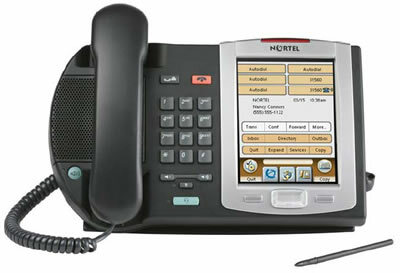 It's WHAT you can use the Nortel 2007 IP Phone display for though that makes the Nortel IP 2007 stand out. The "standard" display output is the usual business telephone functions - like your phone directory, autodial, message retrieval and more. However, through the "Applications" softkey, you can access other functions (if provided by your system) for such things as directions and road maps, company news, weather and even see who's at the front door by using the phone as the monitor for your security camera! The possibilities are incredible. The Nortel IP Phone i2007 has a USB port that supports standard USB mouse and keyboards for simple “point-n-click” access and navigation. Business telephony features are robust as delivered from Nortel Communication Servers. *Power over Ethernet (PoE) delivers power from the Data Switching Equipment over Ethernet cabling via the IEEE 802.3af specification. By supporting Power over Ethernet, the IP Phone 2007 eliminates the need for power splitters and AC outlets, resulting in a more reliable and cost effective solution.